Aurelia’s Monday to Sunday Bamboo Muslins come individually be-ribboned and housed in a chic presentation box – a perfect ‘just because’ gift for a skin care obsessive, or excuse to upgrade your old face cloths. Super soft and gentle, these are perfect for use with Aurelia Probiotic Skincare’s Miracle Cleanser – lightly buffing your complexion to eliminate dulling dead skin cells and stimulate bloodflow – without scrubbing or upsetting sensitive skins. Made with natural bamboo fibres (which offer superior, antibacterial properties), these are finely woven and incredibly respectful; effortlessly eliminating dirt, make up and residual cleanser to leave your face feeling velvety soft with a natural glow. Organic and machine washable, Aurelia recommend no more than two uses per cloth, so this box provides a week’s supply. 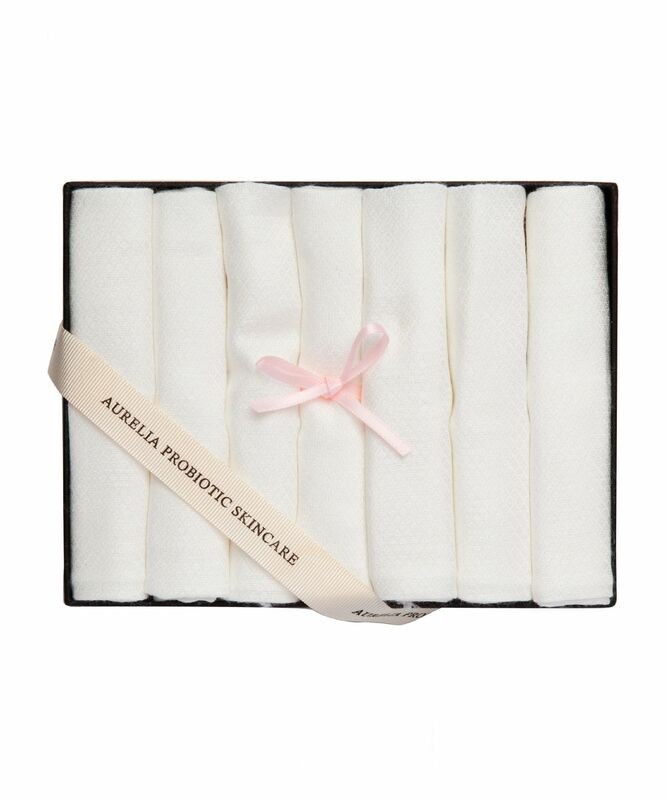 An adorable box of seven, super-soft organic bamboo muslins, this is the ultimate accompaniment to Aurelia Probiotic Skincare’s Miracle Cleanser – gently sloughing dulling dead surface skin cells, without irritating even delicate complexions. Having scooped up an astonishing 24 prestigious awards in just 24 months, Aurelia Probiotic Skincare’s innovative range of all-natural, anti-ageing British skin care harnesses the power of probiotics – good bacteria which help promote the optimal environment for skin to thrive, whilst limiting the level of sk-inflammation (one of the primary causes of skin ageing). Formulated with 100% pure BioOrganic botanicals, this evidence-based range has proven that nature can be scientific, and that you can achieve remarkable results without a single chemical. To achieve ultimate daily results follow our indulgent two-step process. Step one: Apply the creamy cleanser to dry skin, massage deeply with fingertips to lift daily grime and make-up away from the skin and stimulate circulation. Step two: Remove cleanser with Aurelia’s antibacterial bamboo muslin to gently exfoliate and reveal a bright, clean and glowing complexion. Ensure the cloth is warm and damp and gently sweep over the skin. Pat dry and follow with Aurelia’s Revitalise & Glow Serum. Have been using these for about 2 years now, and love them. I use a fresh one every single day, so they have been through a hot wash dozens and dozens of times, and are still perfect. I have sensitive skin and found a regular face cloth was too rough for my skin. These are perfect! I was surprised when they arrived as they looked so small but they work perfectly and the size and lightness make them perfect for travelling. I would highly recommend them....so much so, that I am writing a review (my first ever!) About to order some more. I love these muslin's and use them every day with Oskia's Perfect Cleanser. Very gentle on your skin and perfect for removing makeup as you can pop them in the wash and they are like new afterwards. Would be a great gift as the packaging is lovely. These are great as a gentle exfoliator and I would highly recommend them. Very soft and works as gentle exfoliator. Recommended.